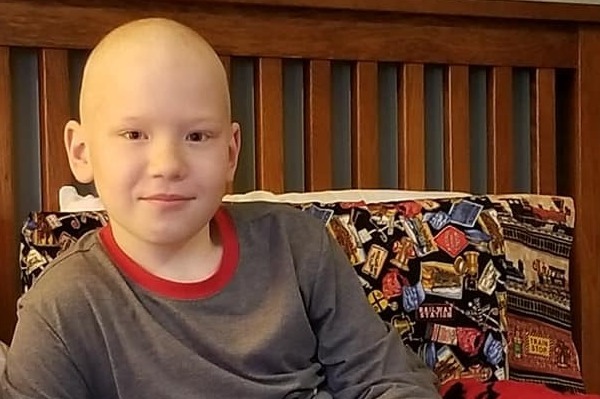 Help Derek, a 10 year old who is in 5th grade and just diagnosed with a brain tumor on November 6th and his family by donating what you can. Donations will help defray medical costs, travel costs to Mayo Clinic in Rochester Minnesota, Hotel Costs as they await acceptance into the Ronald McDonald House, lost wages (his mother has only been paid 2 days since diagnosis) and household bills and more. Derek loves Dell Rapids and is a friend to everyone he meets. He loves his family, baseball, comics, and his dog Jeter. He hopes to be a teacher when he grows up, he just needs the chance. Derek underwent surgery to remove a tumor from the base of his skull Wednesday Nov. 7th. The tumor was malignant. Derek has been diagnosed with Medulloblastoma. He will start 6 weeks of proton radiation therapy at Mayo Clinic of Rochester, Minnesota (4 hours from home) December 3rd. Derek is looking at a minimum of a year of chemotherapy treatment to battle his cancer. Any help you can give is appreciated. Today Derek had his last Chemo for round 2. We now have 3 weeks off. We found out that Derek has Neuropathy. On a scale of 0-20 he has a scale of 13. He has significant weakness in his hands, fingers, wrists, ankles, feet and toes. His toes are dropping which causes his right foot to turn in significantly. He has the inability to turn his wrist and place his hand up (LIke if you were the Supremes and doing the STOP! motion from Stop! In the Name of Love). This explains why on the morning we left for our Make-A-Wish South Dakota trip he was unable to use a baseball glove to play catch with Jim Berman. Derek will be doing daily exercises to improve his strength. He will now be getting braces for both legs as well. Dr. Mahar and PT Dan will be continuing to evaluate and see if we need to stop the Vincristine maintenance Chemotherapy or if the long term damage is too risky. Vincristine is great at killing latent cancer cells, but doing permanent damage to Derek. If you know my son at all you know that he will not just do the assigned homework and exercises he will attack them. Derek described his fingers as clumsy. He said that he lost the ability to hold his pen this week at school. Derek has not touched Legos for 3 weeks, That is really unusual for Derek...really unusual. He told us that his hands hurt bad after finishing the Hoth set that Lou George got him. PT Dan told him he needs to do Legos, that working Legos, manipulating those small pieces, will help him. He has about 7 sets that he hasn't touched yet; so he is going to work on some small sets and really take his time on the big sets. Derek will get through this. It doesn't look like baseball is in the cards this summer, but he can run the books and MAYBE get one the field one or two times, or even just swing the bat in one game that would be amazing. BUT that is such a small thing in the big picture. We are just so blessed with the care we are receiving and how proactive our care team is. Sunday we leave for Rochester and Derek's 3 month radiation and cognitive check ups. Share if you would please. Derek is currently at the Castle with Donelle. He is probably getting ready to be sedated. He has 3 hour spine and brain MRI today to make sure there isn't any regrowth of tumor. I am awaiting text updates from Donelle. Tonight we begin our 8 days of hotel living. Due to pending snowpocolypse, we are staying Friday, Saturday and Sunday night in hotels in Sioux Falls. We want to make sure that nothing stands in the way of getting on our flight at 6:00AM Monday morning for Florida for Derek's amazing Make-A-Wish South Dakota trip. KSFY News will be at the airport at 4:15AM Monday to report on Derek's adventure. We are so looking forward to this trip and experiencing this all through Derek's eyes. New York Yankees, The Wizarding World of Harry Potter, Star Wars Hollywood Studios, and LEGOLAND Florida are on the agenda. Any one of those would bring a lifetime of memories. That Derek gets to experience all of them is simply a miracle. Thank you to Tom Hebert for watching over the house while we are gone, Tara 'Sanger' Baker and family for taking care of the dog, and Patrick Fritz for making sure the show is removed. We are all so thankful to everyone who has contributed to making this trip possible. 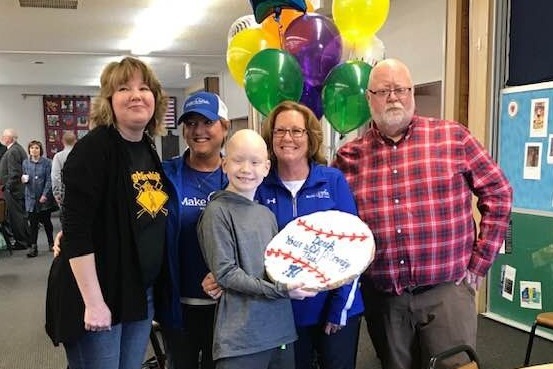 Thank you to Mary Pasch for getting the ball rolling with Make A Wish, to the Loiseau family and team at Loiseau Construction, Inc for sponsoring Derek's wish and each of you that have given to ease Derek's burden. Watch my page and Donelle's page for updates from the trip. What an amazing morning. The Community Waffle Feed and Silent Auction was a huge hit. Thank you to Pastor Jeff Sorenson and everyone at Lutheran Church of Dell Rapids for the effort. Thank you to everyone that donated items for the silent auction. The love that we felt today has filled our heart. So happy that Derek felt well enough to sit at the benefit and see his friends. It was great to watch Derek and Talen visit and laugh and for Derek to see Parker, Luke and all his other classmates. He misses all of them. The highlight was when Make-A-Wish South Dakota came in to reveal Derek's wish to him. We will be headed to Florida on the 11th of this month. We will be seeing the New York Yankees play the Philadelphia Phillies on the 12th. We get special passes, Derek gets to go on the field for batting practice and to meet the players, we get to eat in the Dugout Club and get great seats for the game. The next day we go to Universal Orlando Resort to Harry Potter World. The next day we go to Walt Disney World for the Star Wars adventure. Our last day we go to LEGOLAND Florida. Joe and the entire team at Make A wish worked hard to make this special trip happen for Derek and they were able to check every box on his Florida Vacation wish list. Donelle, Derek and I are so grateful to Louiseau construction co., Jennifer, Mary Dell, Jim, Shaw and the entire crew for graciously sponsoring Derek's wish. Thank you isn't enough. But sincerely thank you all and God bless. Derek responded well to his first round of Vincristine Chemotherapy. This is the same Chemo Drug he was on at Mayo Clinic. We have the same side effects as we had at Mayo with this particular drug so we are prepared for it. He is ravishingly hungry following the chemo, then we struggle with appetite the next few days and he runs a low grade fever. So we are back to taking an appetite stimulant and we are taking temperature more often. He is going to school the next three days to work with his teacher from 10:30 to noon to continue to stay caught up with his classmates. Brady Lesnar, Kelley Gruneich and Natalie Eggers have been so amazing and helpful with Derek's educational needs. At home we are working on his first communion paperwork as well so he can stay on pace with his peers there as well. Marsha and Tara continue to help with care taking and we are so thankful for their efforts and love. This weekend we have the Community Waffle Feed and Silent Auction at Lutheran Church of Dell Rapids. Make-A-Wish South Dakota will be there about 10 to reveal Derek's wish (shhhh secret). We are very excited about that. This weekend we are interviewing people for summer caretaker for Derek. He is pretty self-sufficient and too smart for his own good, but he is a kid with stage 4 cancer that needs care (whether he admits it or not). We feel like we have a solid group that we will be interviewing. You can still get wrist bands at Rivercity Tool & Pawn, Bar X Bar Flandreau and Bread & Circus Sandwich Kitchen. You can get window decals at Vishnu Bunny Tattoo and you can get t-shirts at T-Shirts Too. We appreciate all the goodwill, donations, thoughts, prayers and acts of kindness. No deed goes unnoticed or appreciated.